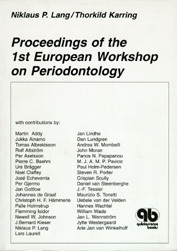 Ästhetische Sanierungen mit fest... Garg, Arun K.
In February 1993, the 1st European Workshop on Periodontology was held at the Charter House at Ittingen, Switzerland. The purpose of this workshop was to discuss the basic aspects of periodontology as well as the clinical practice of periodontics. The latter should, of course, be based on sound scientific evidence. The proceedings of this workshop cover twenty literature reviews, the reports of the five working sessions, and the consensus statements made by each participant at the end of the workshop.